Hello again from sad, dreary, grey Dallas. I think that we are supposed to get some crazy storms here later this afternoon and I’m kind of excited about it. That’s one of the nice things about riding the bus to work- I don’t have to be the one driving when the weather gets awful. But then one of the not so nice things about riding the bus- having to wait outside for the bus to arrive. An umbrella can only do so much. So not looking forward to that later.. Anyway, on to the point of today’s post. 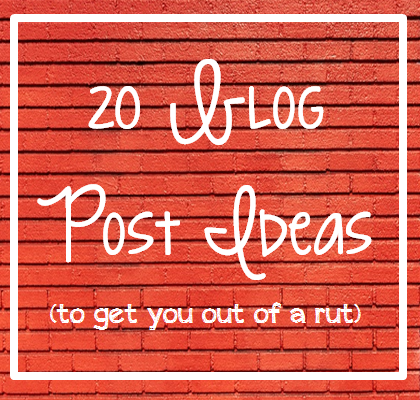 Last month I made a list of 20 blog post ideas (hopefully some of them were helpful! ), and I wanted to bring you 20 more! Some of these I have used in the past, some of these I plan to use in the future- and maybe, just maybe, you can use them, too! Hopefully you got some more ideas from this list! I’ll be posting another one next month with even MORE ideas for you! Happy blogging! I love this- thanks for all the great ideas! 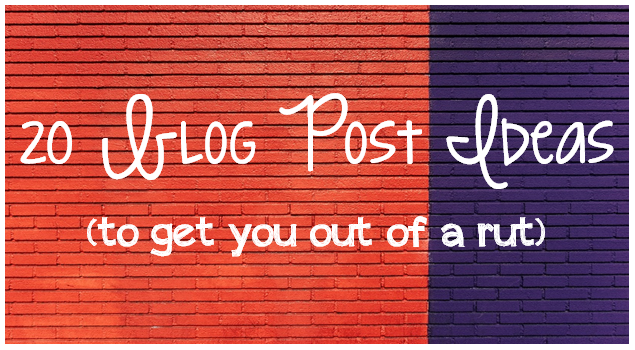 Some days I want to blog, but am not sure what to write… this will be super helpful! Loved this, thank you for the tips and ideas! I totally appreciate these 🙂 Thank you! Thanks- I hope they’re helpful! !